Yesterday marked the beginning of a new era of economic dystopia — at least, if the stock market is any guide. Former U.S. Federal Reserve chief Alan Greenspan called the current stock market freefall a once-in-a-century economic crisis. After the collapse of US investment bank Lehman Brothers, the Dow Jones Industrial Average fell more than 500 points, its largest one-day point loss since the September 2001 terrorist attacks. And as U.S. citizens contemplate the collapsing housing market and the insane bailout of lenders Fannie Mae and Freddie Mac, things are starting to feel distinctly depressing — or should we say recessing? It's interesting to compare pictures of today's high-tech New York Stock Exchange — filled in this picture with panicked traders — with pictures of the lower-tech one in 1929, just days before the famous stock market crash that began the Great Depression. 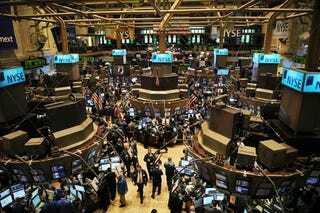 Here you can see the same NYSE building, with its characteristic circular meeting areas, on a crowded day. Over the years, those circular trading areas have retained their shape, but become encrusted with monitors and computer terminals. Though there is a great deal of debate over what the exact forces were that caused the Great Depression, many facts are clear. On so-called Black Thursday, October 24, 1929, the news reported that the Dow Jones had plummeted 17% over the last month. Panicked, investors started bailing out of the market and traded a whopping 12.9 million shares that day, causing an even greater financial panic. The following week, on Monday and Tuesday, the market fell even further. 16.4 million shares were traded Tuesday, and by the end of that day the market had lost $14 billion in value. The week the stock market crashed, it is estimated that the market lost $30 billion in value, which was more than the U.S. spent in World War I. Like this week's stock crash, the 1929 crash was caused by panicked trading in response to bad news about the market. For millennia, the solid building stands on a solid base . . . Typically, the base anchors a structure and connects it emphatically to the ground.The essence of the stock market is speculation: it is based on capital, not gravity . . . [This suggests] an architectural invention: our project is a building with a floating base. As if it is lifted by the same speculative euphoria that drives the market, the former base has crept up the tower to become a floating platform. As a great philosopher once said of capitalism: "All that is solid melts into air." That sounds beautiful until the solid thing turns out to be your house. Image of contemporary NYSE via STAN HONDA/AFP/Getty Images; image of Shenzhen stock exchange via OMA.